TrueGrit® is the proprietary texture additive uniquely designed to add strength and other benefits for PerfectPrimer® and all resin-based coatings. How is it different? TrueGrit® is the only texture filer that increases the tensile strength of any coating it is added to. Unlike a natural or synthetic stone, it is an organic, pH neutral, cellulose fiber. This fiber combines with all resinous coatings and has no sharp edges that can weaken, cut or tear them. How does it work? TrueGrit® is mixed into PerfectPrimer®. This converts it into RubberDecky overlay or PhillyPutty spackling paste and crack filler. This is then sprayed, rolled, troweled or brushed onto any surface for your desired purpose or effect. 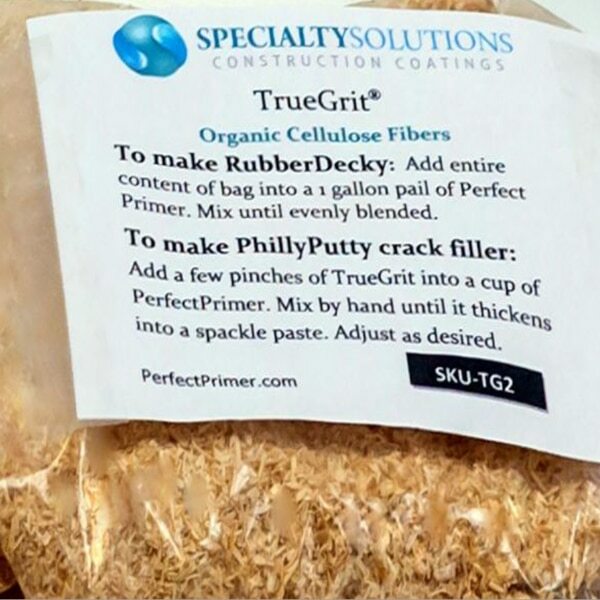 What are the benefits of TrueGrit® ? Provides a smooth, (not sharp or rough) texture. Performs under the most extreme weather conditions.